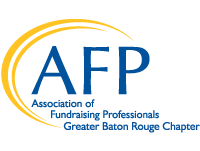 The Greater Baton Rouge Chapter of the Association of Fundraising Professionals will lead the community in Celebrating Philanthropy by honoring the most generous philanthropists, most dedicated volunteers and most talented professionals of 2018. We invite you and your organization to join us in recognizing the 2018 award recipients and consider becoming a sponsor of National Philanthropy Day. Thank you for joining us to recognize and celebrate these outstanding members of the Greater Baton Rouge community.